Lots of non-stop action for the past few minutes. 3:05 left in regulation with the score knotted at 3-3. A couple minutes of back and forth hockey still leaves us tied at three each with 3:05 to play. 3:05 to go. Tie game. 3:05 left, tied at 3-3. UW's fourth line got caught out on a long shift under heavy Minnesota pressure. One minute remaining in the third period! Last minute of the third. Tied 3-3. Badgers with a huge surge late but can't bury one. Headed to overtime. END 3: Wisconsin and Minnesota are tied 3-3. Big UW push in the final minute of regulation. Bischoff with a huge blocked shot to keep it a tie game, we are headed to overtime in Wisconsin! The Badgers had a flurry of chances in the last 30 seconds and Corbin McGuire nearly beat the buzzer. Kohl absolutely rocking. Tonight's announced attendance is 12,589, UW's largest since the Saturday game against Minnesota last season. Big blocks both ways in the opening minute of OT. One minute gone in the five minute overtime period. SOG 39-32, #Gophers . 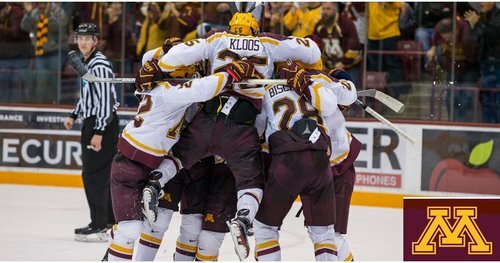 GOPHERS GOAL: Kloos wins it on a rush up the right side 1:43 into OT. 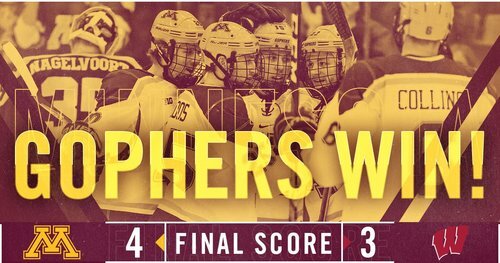 Gophers 4, Badgers 3. Minnesota scores in overtime to win the game. 4-3 the final score. #GOPHERS GOAL!! 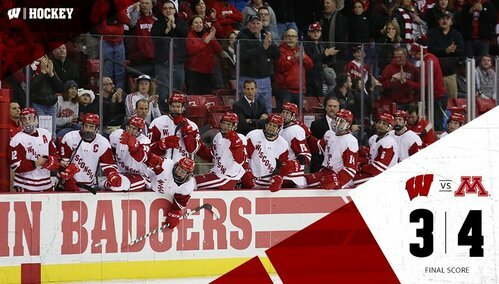 It's an overtime victory in Wisconsin! Captain Klooooooos seals the deal for the Maroon & Gold! Goal was reviewed but counts. Kloos from Sheehy and Sadek at 1:43 of OT for the Gophers. All 4 Gophers goals tonight were scored from within ~10 feet of UW net. Not the kind of net-front presence UW is looking for there. UW coach Tony Granato: "I thought we could have been better. ... They're ranked as high as they are because of the skill that they have."